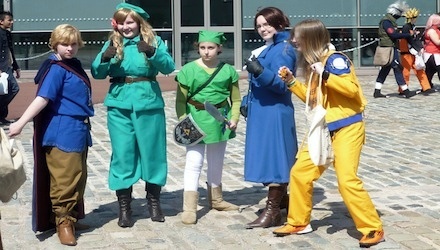 Manchester MCM 2011 - This Is My Joystick! July 30th saw the opening of the very first MCM event in Manchester, and I don’t think anybody could have truly anticipated exactly how popular it would be. There was very little room to breathe, each and every stall was completely packed out with fans and friends ready to fork out money for their favourite figurine, cosplay item or signature from the famous names in attendance. I honestly don’t think I have ever seen so many people in such a small space, with even more trailing outside in a huge queue. I have now attended every MCM that is currently held across the country, so I have a decent back catalogue of information to base my opinion on. I remember attending the first Midlands MCM in Telford many years ago and not exactly being bowled over by it, but I gave it the benefit of the doubt. I felt much the same about the one held in Manchester, but then I remembered that this was the first time the MCM had ventured above the Midlands and the small convention hall didn’t seem so bad then. As is always the way with these smaller events, I find that it is the attendees that steal the show with a sea of cosplay (Not always good, granted) and love for everything geeky. A sea of life anime and gaming characters swarmed through the tiny convention hall, a surreal scene to see groups of people dressed up and eating burgers and chips outside. Some costumes were elaborate, some looked as though they had only taken five minutes to throw something together. A cast of colourful characters! The thing that reminded me the most of my time at the Midlands MCM was the Robot Wars arena. I remember growing up watching Robot Wars, and even though Craig Charles wasn’t presenting it, being in the presence of him in the same room as the small battlegrounds was enough to give me a huge sensation of nostalgia. Various battles were held throughout the day, some monstrous robots being showcased and torn apart by others. They’re a bit bigger than they appear on the TV! Gaming was sadly only made up of three booths with the same amount of games on display. Super Mario 3DS looked to be the most popular with fellow gamers, no doubt many losing themselves in the nostalgic wonders of the latest 3DS port. 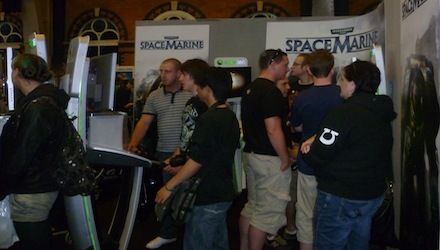 The other games on show were Warhammer: Space Marine and Earth Defence Force: Armageddon. Viewing Warhammer from a distance, I got the vibe of playing Halo slayer matches online, which is definitely a good thing and this may even make it onto my ‘to buy’ list. Earth Defence force was almost a hybrid of Crysis and Crackdown, mixed in with some alien bugs for good measure. The mode we were playing appeared to be perhaps a co-op mission, but it was unclear as to what we were really meant to be doing after a while, so we swiftly gave up after an enjoyable romp shooting alien ants to smithereens. The only other games that were playable at the event were various Dance Dance Revolution stands, mostly with casual observers and the occasional brave face who decided to bust a move in front of the professionals. In this same corner there appeared to be a small amount of obscure Japanese music games which I have honestly never seen before. It took me back to the days of Parappa the Rapper and his strange appearances on the PlayStation many years ago. There were also some retro games on display, offering up original versions of N64′s Ocarina of Time and the classic Final Fantasy series on the original PlayStation for purchase. For a first attempt the Manchester MCM was a raging success. Each and every stall was swarming with fans and retailers with a real passion for what they do. While there was a disappointing lack of gaming on show, I am hoping there will be much more to come from the ever-popular MCM now it has come to the North. Perhaps organisers will realize next time exactly how popular a convention like that can be in this country!